Home / Features / Can a methadone clinic benefit a community? Can a methadone clinic benefit a community? According to the Centers for Disease Control (CDC), about 66 percent of the more than 63,600 drug overdose deaths in 2016 involved an opioid. In addition, the CDC reports that the number of overdose deaths involving opioids (including prescription opioids and illegal opioids like heroin and illicitly manufactured fentanyl) in 2016 was five times higher than in 1999. Rico Hernandez, left (in blue shirt) and Joseph Delgado, right (in blue shirt), both staff members from the Community Medical Services outpatient addiction treatment clinic at 23rd and Northern avenues, help direct the steady flow of traffic for patient drop-off/pick-up, while an off-duty Phoenix police officer patrols the area (photo by Teri Carnicelli). As federal and local governments try to figure out how to combat the crisis, private companies are investing in clinics to offer treatment to these primarily heroin addicts, and because of the widespread nature of this addition, business for these companies is booming. One Scottsdale-based company, Community Medical Services (CMS), wasn’t prepared for the number of clients it would see at an outpatient addiction treatment clinic it took over a few years ago at 23rd and Northern avenues. The huge influx of new clients not only overwhelmed the clinic but impacted the adjacent neighborhood as well. A task force made up of state, city and neighborhood leaders, along with representatives of CMS, has been meeting to address concerns about the methadone clinic at 23rd and Northern avenues. Currently there are very few, if any, specific city or state zoning regulations when it comes to the location of these types of treatment facilities. Unlike medical marijuana dispensaries, which have several layers of zoning regulations, these so-called “methadone clinics” can exist anywhere there is an already present C-2 zoning—and nothing prevents them from operating 24-7, as the Northern Avenue clinic began to do in November last year. But State Sen. Kate Brophy McGee hopes to see that lack of regulations changed in the next legislative session. And City Councilwoman Debra Stark, who represents the Sunnyslope area, also wants the city to take a closer look at the zoning code to see if something can be added to more closely regulate this growing for-profit industry that serves those suffering from addiction. At its peak, the CMS clinic was seeing about 1,800 patients a day. The two small parking lots couldn’t accommodate the continuous flow of contracted vehicles (mostly through Veyo) dropping off and picking up clients, and the inside waiting room would become overflowing, with patients waiting outside, sometimes along the sidewalk or at nearby businesses. The result of such a mass of people in a relatively small area was felt immediately by adjacent residents and business owners. Hillary Rusk, who is an active member of the Royal Palm Neighborhood Association, heard complaints of loitering, trash, people dealing drugs on their property, Veyo drivers using other businesses’ parking lots, jaywalking, and more. Going 24-7 late last year brought in more clients than expected in the overnight hours. Currently meds are administered between 4:30 a.m. and 11:30 p.m., and then again from 1 to 8 p.m. Monday through Friday, and 5 a.m.-2 p.m. on Saturdays and holidays that fall on a weekday. Intake hours, which can involve blood tests and other drug screenings, signing up for services and processing insurance, are 24-7, either by appointment or via walk-in. But it’s the flow of patients that begins at 4:30 a.m. that had grown to a breaking point for the clinic and the adjacent community. While security was previously provided by a contractor during the day, and by off-duty Phoenix police officers overnight, as of mid-August CMS is working exclusively with the Phoenix Police Department, with off-duty officers in uniform, on-site, 24 hours a day, in eight-hour shifts. CMS has submitted a plan to the city’s traffic engineer about connecting the two parking lots and changing the flow of traffic to keep it from backing up onto the street. There also are two staff members who stay in the larger south parking lot to help direct the flow of traffic. But perhaps the biggest impact has come from a CMS clinic that opened in late July at Glendale and 51st avenues. More than 400 clients already have had their cases transferred there from the Northern Avenue clinic, with a total of 500 expected to be transferred by the end of September..
Another clinic is tentatively scheduled to open in October near 27th Avenue and Indian School Road. 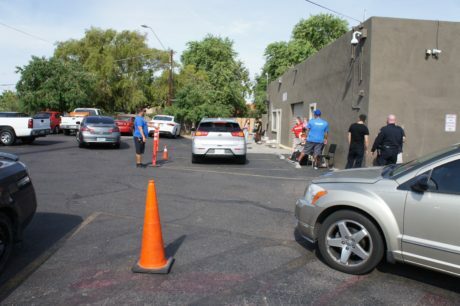 But additional clinics will be needed, not just to ease the burden at the Northern Avenue clinic, but to accommodate the large number of addicts seeking treatment in Phoenix. And, Stavros, said, particularly in the nearby Sunnyslope community. A clinic in the ’Slope? “We mapped out addresses of existing patients who go to the Northern Avenue clinic, and the largest concentration, outside of the I-17 corridor, was from Sunnyslope,” Stavros said. Stavros calls it a “hot spot” and said there is no question that a clinic there would greatly benefit those in the Sunnyslope community who are seeking help in fighting their opioid addiction. CMS is looking for an appropriate site, and Hatcher Road is on the radar, particularly since there are already social service agencies housed along that roadway, providing a sort of cluster of complimentary services. Stavros admitted the very public mistakes made at the Northern Avenue clinic have hurt CMS, even as the company is trying to get those fixed. But he emphasized that any new locations will already be designed to prevent those same problems. His assurances may not be good enough for a community already on edge about these types of facilities, and the perceived clientele they serve. “It really is a problem; I understand we need to treat these people recovering from addiction, but the neighborhood should not have to pay the price,” said Sen. Brophy-McGee, who lives in Sunnyslope and represents Dist. 28. “We are hoping to present some kind of solution next session with the legislature. And Brophy-McGee, along with Councilwoman Stark—who represents Sunnyslope—both contend that government oversight needs to be created to prevent future negative impacts on neighborhoods. She said that officials from AHCCCS (state insurance provider) and Mercy Maricopa (licensing agency) responded that the CMS clinic is now under a remediation plan to reduce the volume of patient traffic and Veyo traffic. The goal is to reduce from 1,800 patients per day to 240 per day, with corresponding transport reductions, within the next six months. AHCCCS will provide frequent updates to the Task Force regarding patient census, which will be shared with the neighbor leaders. But it may come as a surprise to those leaders how many of the clinic’s clients are from those very neighborhoods they represent. Stavros said that “people have a pre-conceived idea of who these ‘addicts’ are—but in reality, it’s everyone”—stay-at-home moms, high school coaches, business owners, college athletes. The path to addiction is wide and varied, and can impact anyone, from any walk of life, he pointed out. This really is an outrage! Crime is high, kids can’t even play outside because of all the drug people running the streets. I’m terrified. Close all the clinics and let the druggies overdose. That’s what they want anyway. They are leaches in society, they do nothing. Why let our neighborhoods and children go down for people that want to ruin their own lives. I certainly agree strongly with Julie’s reply! Just because people make the WRONG choices, why do WE the tax payers (who do not indulge in this way of coping or living) have to foot the bill out of our hard earned money to pay for their care and rehab with a methadone clinic in family neighborhoods?? We are also being kicked twice in the seat of our pants with these “clinics” being smack dab right in the middle of our back yards so to speak, because not only are we the tax payers footing their rehab bills, they are causing crime in our areas to drastically increase as well! It’s a documented FACT that our crime rate has increased by a BIG margin due to the light ( AKA BLIGHT RAIL) and this clinic!! We as a beautiful upscale neighborhood are fighting back to take our neighborhoods back!!!! I live down the street from that horrible mess on northern. I am demanding that it is shut down and relocated Immediately. Sick and tired of the mass of traffic and junkies leaving their trash and crap around and flooding the neighborhood with sketchy people which is ALREADY BAD because of homeless junkies. Lawyers for the homeowners in this neighborhood are going to be interviewed.